mily Bamforth has a bone to pick, and it happens to be hundreds of millions of years old. “People see dinosaurs as nothing more than big monsters,” says the PhD candidate in paleooecology and paleobiodiversity.On Jan. 20, Bamforth will clarify some of the more popular misconceptions about dinosaurs during her lecture “The Misunderstanding of Dinosaurs.” The event is part of the Redpath Museum’s ongoing Freaky Friday series. 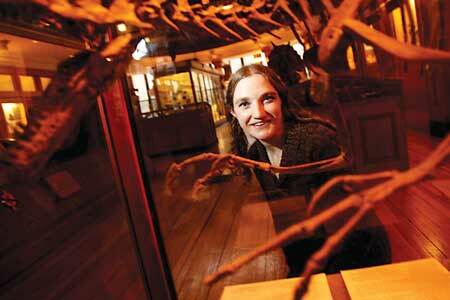 Emily Bamforth has a bone to pick, and it happens to be hundreds of millions of years old. “People see dinosaurs as nothing more than big monsters,” says the PhD candidate in paleooecology and paleobiodiversity. On Jan. 20, Bamforth will clarify some of the more popular misconceptions about dinosaurs during her lecture “The Misunderstanding of Dinosaurs.” The event is part of the Redpath Museum’s ongoing Freaky Friday series. Bamforth, who knew she wanted to be a paleontologist after seeing her first dinosaur skeleton in a museum in Cardiff, Wales, does most of her fieldwork in southeastern Saskatchewan, in the badlands of Grasslands National Park and the Frenchman River Valley. There, she scours vertebrate microsites – where she hopes that the high accumulation of small fossils and bone fragments will give her insight into the changes in biodiversity over a period of about 600 million years right up to the dinosaur mass extinction.